... another retail icon is set to go under. According to a Tuesday press release from S&P, David's Bridal missed an interest payment on $270 million in unsecured notes, prompting the ratings agency to downgrade the apparel retailer's credit rating to a level indicating "selective default." The missed payment sets into motion a 30-day grace period with debtholders before the retailer is fully in default; this means that absent a miracle, David's Bridal will be the next major outlet to be dragged into bankruptcy court as a result of the collapse in brick and mortar retailers, and Jeff Bezos becoming the world's richest man. S&P analysts agreed, and said they believe David's Bridal is "highly unlikely" to make the debt payment as the company tries to preserve its liquidity. They added that a debt restructuring "either out of court or through a court reorganization" is "likely in the near future." As Retail Dive observes, David's Bridal - which last June made the Moody's list of distressed retailers most likely to file for bankruptcy next - has been trying for the better part of a year to reduce debt obligations and build in some financial wiggle room without success. S&P downgraded the retailer several times during that period as the risk of default — either through a distressed exchange or a bankruptcy — rose. In May, Debtwire reported that David's Bridal - which was saddled with debt after its $1.05 billion 2012 LBO - hired investment banking advisory firm Evercore to help with its financial options. In preceding months, creditor groups formed in anticipation of David's Bridal making a deal with some lenders, which could include spiriting off its intellectual property or brand value to a protected entity in order to win an agreement, as J. Crew did last year. Also last June S&P that it believed David's Bridal could announce a distressed exchange or debt restructuring within six months as the retailer continued to "report weak operating performance, and liquidity has become further constrained." Instead of announcing a deal, the company missed a major debt payment, a virtually guaranteed precursor to a bankruptcy filing. As Retail Dive reports, David's Bridal - which this year named a new CEO in Scott Key - has struggled for a long time with declining sales and a troubled balance sheet. Analysts see a specialty retailer beset by problems in its sector, capital structure and of the company's own making. Increasing competition and "casualization" are challenging the wedding sector, according to Moody's. But David's Bridal — which since 2012 has been owned by private equity firms Clayton, Dubilier & Rice and Leonard Green & Partners — also fell behind on its digital investments and suffered from issues in a 2016 website redesign that dropped the search rankings of some products, so it wasn't just Amazon's fault. It's all led to a 30% drop in the company's earnings since 2012, according to Moody's. The retailer isn't the only one in the space struggling. J. Crew two years ago shuttered its bridal effort, and last year bridal retailer Alfred Angelo shut down unexpectedly. More recently, Weddington Way, acquired in 2016 by Gap, said it would close all its test stores and shut down its website. 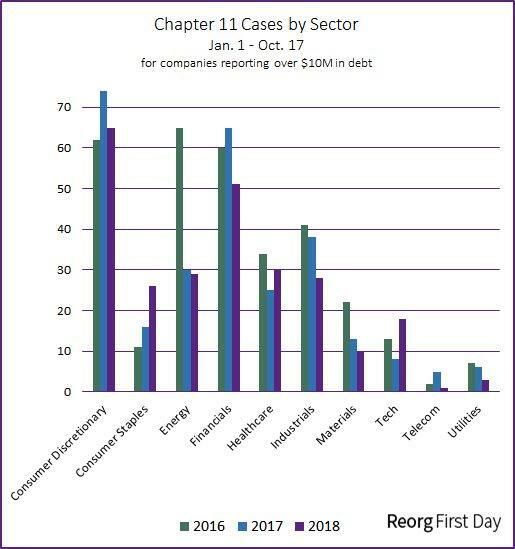 As for the ongoing rout impacting consumer discretionary names, contrary to speculation that there has been some improvement in the space, the following chart from Reorg First Day shows that for the 3rd year in a row, the consumer discretionary space has had the highest number of Chapter 11 cases in the YTD period with little hope of a reversal in the near and not so near future.